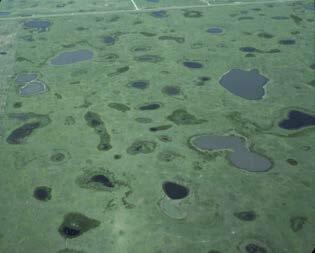 Seasonal wetlands dominate the Prairie Pothole Region, as seen in this aerial view. The reason prevented planting payouts are concentrated in the Prairie Pothole Region is simple – growers are trying to plant crops on land that is too wet in the spring, even when the weather is normal. The "potholes" in the aptly named region are actually seasonal wetlands that are wet or flooded in the spring but dry out in the summer or fall. Inability to plant these seasonal wetlands in the springtime is the norm. As a result, the primary cause of loss that generates payouts is excess moisture, and the most payouts go to counties with the most seasonal wetlands – where "excess moisture" in springtime is entirely predictable. Farmers seeking to plant seasonal wetlands in the Prairie Pothole Region are the overwhelming beneficiaries of prevented planting crop insurance payouts. This is bad news for the U.S. Treasury and for these ecologically important wetlands. The moisture-triggered payouts are so big and so frequent that they create powerful incentives for landowners to keep plowing up seasonal wetlands. Growers have little to lose since payouts are nearly guaranteed, covering any losses they might incur if it's too wet to plant. In fact, the 2013 Inspector General's audit concluded that the payouts likely overcompensate growers. The audit found that the payouts were historically higher than farmers' pre-planting expenses for seed, fertilizer and other requirements. As a result, prevented planting insurance poses a grave risk to wetlands in the critically important region. More than 50 percent of North America's breeding waterfowl depend on these seasonal wetlands, and 40 species make their home in the Prairie Pothole region. In spring, the wetlands also retain water that could otherwise make flooding worse downstream, and they help recharge aquifers that supply water to the area's farms and people. Repeated plowing of seasonal wetlands in late summer or fall rips out wetland vegetation and shrinks the size and depth of the wetland over time. Soil erosion from adjacent cropland increases and the wetlands fill up with mud much faster than they would otherwise. Water levels in farmed seasonal wetlands become more variable, degrading their value as habitat and their capacity to prevent floods. More troubling – but hardly surprising – is that seasonal wetlands are concentrated in the counties that receive the most prevented planting payouts for excess moisture. The 65 counties that got payouts every year from 2000 to 2013 encompass fully 46 percent of the total wetland area in the Prairie Pothole Region, according to the U.S. Fish and Wildlife Service's National Wetlands Inventory. Add the 29 counties that got these payouts in 13 of the 14 years and the percent of wetland area jumps to 69 percent. This is truly bad news for taxpayers and the environment. "To understand why a farmer would destroy a wetland, you need to understand something about crop insurance. Many shallow ponds and marshes are classified under federal regulations as ‘farmed wetlands.' They can't be drained, but they can be farmed if they're dry, and many are right now. "Ephemeral wetlands might not seem like the best place to grow corn, but a return on the investment is guaranteed. If a farmer can get seed into the ground and corn grows, the return is obvious, especially with prices hovering near $8 a bushel. "If the crop fails because, say, the wetland fills up in the spring, the farmer can claim the loss under federal crop insurance, potentially for several years." "Changes Ahead for South Dakota Pheasant Hunting"